GrabFood will be integrated into the main Grab app, with its beta test beginning end April in Singapore, and 17 April in Kuala Lumpur, Malaysia. The existing GrabFood apps for Singapore users, merchants and delivery partners will be discontinued after the rollout islandwide. Head of GrabFood Lim Kell Jay says they are working on central kitchen to open “sometime this year”. As Grab previously mentioned a couple of months ago, they just announced today that GrabFood will be joining its main Grab app. At long last, you won’t have to use a separate GrabFood app, and wait for it to launch while you get redirected from Grab. Users can first experience this with its beta launch in the East area of Singapore, covering Kallang, Marine Parade, Geylang and Bedok, by the end of April. Head of GrabFood Singapore, Lim Kell Jay, has said that they will “whitelist certain customers” to get the update first. This would be “tens of thousands” of users who get beta access first, and Lim says those who frequently place food delivery orders in the East region are likely to be selected. Following that, the update is set for an islandwide beta rollout in May. Once the feature has fully come onto Grab’s “everyday super app” across Singapore, the current GrabFood apps will be discontinued for consumers, merchants, and delivery partners. GrabFood users in Malaysia will receive the update even sooner, as the beta launches tomorrow (17 April) in Kuala Lumpur. Making a GrabFood order in the Grab app will be even simpler than before, as shown in this GIF below. On the new GrabFood interface, users will see some new features, such as a recommendations section that will suggest new food places based on your ordering patterns. Users will be able to contact their delivery riders in-app through GrabChat, which will use machine learning over time to create predictive texts. With this move, Lim says the 5,000 merchants on GrabFood will benefit by reaching Grab’s full user base, including users who open the super app to book Grab rides. Merchants will now be able to see the real-time locations of riders who are on their way to pick up food orders, which can allow them to better allocate their time for preparation. The new GrabFood will also give merchants more control over their online store operations, including allowing them to pause orders for a period of time if demand is too high to be met. Likewise, Lim says GrabFood’s 13,000 delivery partners will gain more income opportunities, as they’ll be able to do both food delivery and parcel delivery jobs on the same app. Grab will also start providing exclusive benefits relevant to their delivery partners, as they have already been doing for their drivers by offering insurance products. For delivery partners, some early benefits include discounts on motorcycle lubricant products from Liqui Moly, and dental care benefits from Unity DentiCare. More will be added over time, including healthcare benefits that will be available in the second half of the year. 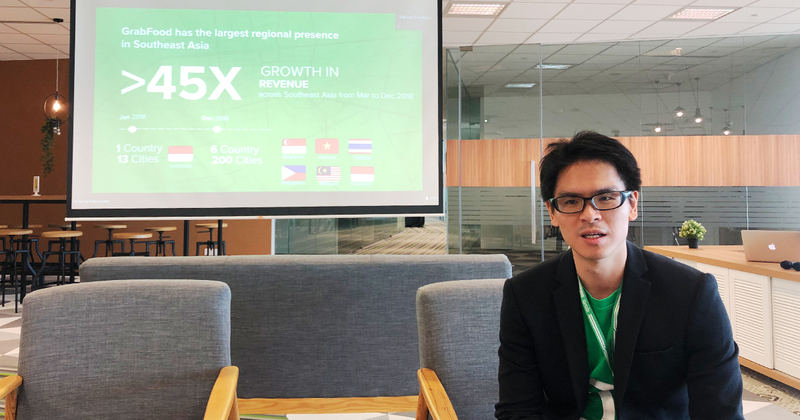 GrabFood, which was created in January 2018, has been the fastest growing vertical among all of Grab’s businesses. Its Singapore arm has seen sales rising by 25% month-on-month. While they already carry over 5,000 F&B merchants in Singapore, they have larger plans to offer as many food choices on their platform as possible. “There are about 10,000 food establishments that are registered with the National Environment Agency (NEA). We plan to onboard most of them, if not all,” says Lim. He also responded to queries about whether GrabFood has intentions to catch up with its competitors like Deliveroo in the area of physical central kitchens. “I think kitchens are something that will help all our customers. For areas that are relatively underserved, where there’s high demand but not as many options around, that’s where we can possibly set up a Grab kitchen,” he says. This could happen “sometime this year”, although it might not be a dine-in facility, as Lim only mentions inviting merchants “to provide deliveries” at the moment. Even sooner than that, GrabFood users may be able to expect some new features that are currently in the works. These include a re-order widget that lets customers make personalised repeat orders, customer ratings for restaurants on GrabFood, and the option to preorder food in advance—they will be available in the “next few months”.